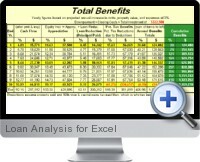 This advanced loan analysis software for Excel is a full featured loan and mortgage analysis tool. It functions for fixed rate, variable rate (up to 3 interest adjustments), principle and interest payments, interest only payments, interest only payments later switching to principle and interest payments the month you specify. The loan analysis software for Excel can accept up to 30 balloon payments and is ideal for anyone wanting full featured loan software for real estate, law practice, or other debt financing and borrowing analysis purposes. It can be applied to real estate loans and mortgages, contract sales and notes, car loans, etc. The Appreciation Software is included as well which calculates past (historical) appreciation of properties. A convenient way to calculate historical appreciation of subject properties and comparable properties to determine a reasonable projection of future price appreciation.